Outspoken Norton legislator Temba Mliswa says Nelson Chamisa's loss to President Emmerson Mnangagwa in the July 30 elections has thrown the MDC leader into depression which could be healed through psychiatric help. 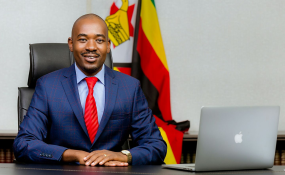 This comes after Chamisa has planned his own mock inauguration weekend as Zimbabwe's President as he continues to dispute Mnangagwa's controversial victory in the poll citing massive poll fraud. Speaking at a media briefing soon after a public HIV test Tuesday, Mliswa said the opposition chief's continued insistence he won the poll was unlawful. "What Chamisa is doing is against the law. He is the breaking the law. He can be arrested," he said. "What he is planning is a threat to state security. That is the truth of the matter. Let us not get excited. "I certainly understand when you lose, you go through a phase; a depression period that one goes through. It is not easy. They would need some form of psychiatric attention. "He needs some help. I do not understand how people who lose an election would want to go further and be sworn in ministers, unless if he is going to swear shadow ministers. "It is sad. I like Chamisa. He is a fine young man. But the more he talks, the more problems he causes to himself."